Anyways, the other day he set out to build himself a catapult. Well what does one do with a catapult when it's all set up? You hit the wall a few times, you chase the cat (as long as it's not set hard), and then you go huh.. built a catapult. What games do your children make up? I am part of the TOS homeschool crew. Been doing it now for 2 years. I find it at times terribly hectic, sometimes immensely disappointing when I don't get a review I want due to location, not needed, not enough time or whatever, I overall find it hugely helpful in our homeschool journey. BUT.. It's also helpful to you my readers. (and to just homeschoolers in general as they research products for use in their own homes). So as I think about reviews, I thought I'd take some time to talk about the pros and cons of doing reviews, and show you some of our favourites. being tied down to a specific product whether it works for you or not for a four to six weeks. Reviews that have been a blessing to us. Chess. Hands down. Chess is it. He loves it and frequently takes his board with him. In fact he's even downloaded a chess game on to his tablet so he can play with friends in the car. :) Makes my heart smile. His second favourite? Veritas Press. I frequently hear.. "MOM! Can I do my history now?" Then comes let's see.. the helpful learning ones... Reading Kingdom. My son SO enjoyed this program and he learned to read better so it's a double win. Birdcage Press was just fun for us. Playing games and learning about history. Being inspired to look things up when we wanted to know more. Maestro Classics. Good music and a story.. need I say more? Bible study Guide for all ages. We still use this. Good product. My son learns more and this is a good thing. Science4Us.com was a good fit in teaching my lad some more independence in choices. He was disappointed when he finally made it through the program. "MOM! Why can't they have more for me???" Gryphon House inspired a co-op class that eight children enjoyed. We made a variety of products and it worked well for us. It's good to explore new mediums and ways of going art as you learn about peoples around the world. Being part of the crew has definitely been of benefit to this household. If you have a blog and would like to increase the opportunities within your household, perhaps it's something you would like to do as well. Think on it anyways. :) Opportunities open up i the fall. 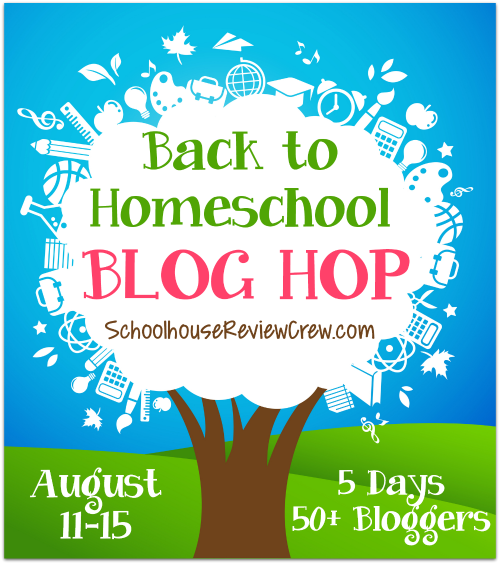 LOTS of us are taking part in a five day blog hop on "back to school" check us out won't you? Perhaps this list will get you started. Hey Lad.... "what do you think of this review idea? It's called The Chess House". "Chess?" was the query. "Chess? Oh.. Chess!" "YES MOM PLEASE... Can we try to get this review? I want to learn how to play chess. Please mom, please?" For the next week I heard "mom... did we get the chess review yet mom? Did we?" And then when we learned we did get the Chess Review it was a constant, "has it come yet mom, has it?" Age Range: all ages but ideally suited to children in the 6-12 year old range. My son's excitement is evident here. :) The kit even came with a chocolate bar. How cool is that? We (as in the whole family) immediately sat down to watch the DVD when it arrived. Hubby's response was: "Oh.. that's interesting. I didn't know that. Well done video". The lad's response: "OH! Mom, they all move differently. When can we play?" My response: "Well done video. It's good to touch up on the rules." 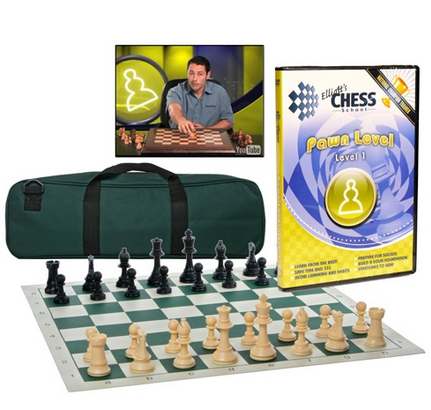 The Chess Set - which comes in a handy carry bag goes with us almost everywhere. He has played Chess with so many different children it boggles the mind. It is a well crafted set. I love that the playing mat is rolled up and not made of stiff cardboard. Means it can easily travel. The playing pieces are of a good size and don't feel or look cheaply made. The DVD is very clear, easy to view, with excellent images. The speaker is articulate. Mom! I'm setting up the board. Can we play Chess now??? Sunny afternoons, rainy afternoons, mornings at the Library, afternoons at friends house, visiting with Gramma... the constant refrain (when not caught up with bugs and crayfish) is "I have the board set up, can we play chess?"